Gutter Cleaning. When gutters become blocked and overflow it is important to get them cleared before any damage is caused. Damage such as dampness in your bedrooms and also foundation and roof damage. Our gutter cleaning service has sunce 2005 built a strong foundation by gaining the trust of our customers because of the quality of the work we provide. This is why Guttering Direct is the preferred choice over other local services. 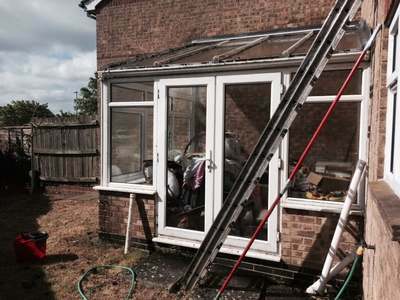 All gutter cleaning work carried out is guaranteed. Our quotations are final and will not change on the day. Fascia Cleaning. If you're looking to improve your home's cosmetic appearance then our UPVC fascia cleaning service will be the best start to home improvement. Many of our customers book us in to clean their gutters inside and out on a yearly basis. This service helps to reduce any discolouration and unpleasant staining happening to the plastic gutters fascias and soffits on their property's. Dirty fascias is due to the build up of grime that results from the weather fronts we have throughout the different seasons and from fumes from near by roads. Nothing beats clean looking fascias! 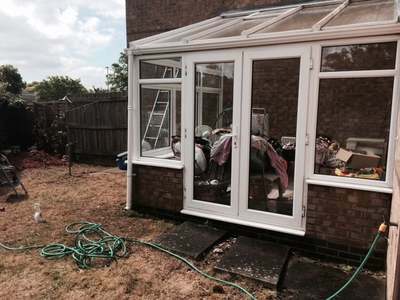 This conservatory was a challenge as it had not been cleaned for a number of years. My conservatory cleaning service will help! It cleaned up pretty well! Why not get your conservatory cleaned? Call me for a free quotation. Conservatory Cleaning. Our Conservatory cleaning service is a must once the spring arrives. Conservatories can get quite dirty during the winter months and to keep them looking bright and clean its a great idea to get them cleaned during the spring. Neglecting your conservatory can lead to discolouration and staining of the plastic frames and glass or plastic. Our services are thorough and we know exactly what cleaning products to use and how to do the very best cleaning job on your conservatory. We have many regular customers who book our services each year to give their conservatory the care and attention that is needed to prolong it's life span.